Taking a modern spin on pueblo architecture, Seven brings the desert valley to life with luxe 1, 2 and 3 bedroom homes. From the nine-foot ceilings to the wood-inspired flooring, every detail in these pet-friendly apartments creates a cozy ambiance. Wake up to the Phoenix sun peeking through the blinds of the energy-efficient windows. After getting ready in your walk-in closet, head to the office, or work from home thanks to the built-in desks available in select homes. Prepare a delicious dinner in a gourmet kitchen equipped with stainless steel appliances and a spacious island. You can even pull a bottle of your favorite white, red or rosé to complement your meal with built-in wine racks available in select floor plans. 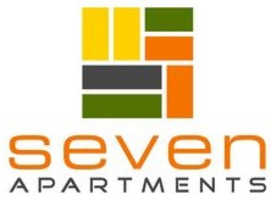 Contact Seven to schedule a tour of your next home.